Wallingford Riegger was born of musical parents in Albany, Georgia, 29 April 1885. The family soon moved to New York where the young Riegger undertook musical studies at the Institute of Musical Arts (now The Juilliard School) with Percy Goetschius and then pursued post-graduate work at Berlin's Hochschule für Musik with Robert Haussman, Max Bruch, and Edgar Stillman-Kelley. A formidable musical talent and intelligence led to assistant conductorships with the opera houses of Würzberg and Königsberg and with Berlin's Blüthner Orchestra. 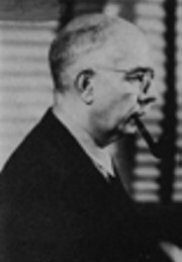 Returning to New York in 1917, Riegger became active as composer, administrator, and adviser to a variety of societies for contemporary music. His thorough investigation of modern musical resources and possibilities fueled a compositional style that appropriated 12-tone techniques and atonality within more traditional neo-classic structures. An aggressive rhythmic sense and free use of all possible tone combinations produced works like Dichotomy (1931) and Study in Sonority, which, in 1929, represented a significant stylistic break with his rigorous classical upbringing. Several dance works, cast in more strictly neoromantic idioms, brought popular success as did his Symphony No. 3, winning a Naumburg Foundation Recording Award and the New York Music Critics' Circle Award in 1948.